3D/CBCT (Cone Beam Computerised Tomography ) is the latest and the most precise method of digital dental radiology. If you plan on using 3D/CBCT or you just want to find out more about it, it will be enough to contact the nearest OrtoDent Digital X-ray Center and we will send you a demonstrator, who will come to your office at a time that best suits you and introduce you to the programs and possibilities. What is 3D/CBCT (Cone Beam Computerized Tomography)? 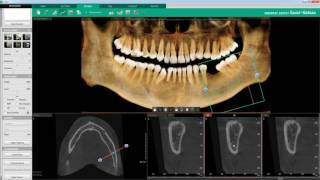 Just for the sake of comparison– orthopantomographic and intraoral scans allow us to view structures in one plane only, and that with different level of geometrical inaccuracies. 3D/CBCT is used to help or to confirm a clinical diagnosis in cases when all other radiological methods have been exhausted or are insufficiently clear. Determining the bucco-lingual bone dimension, localization of the inferior alveolar nerve, examining the morphology of root canals, determining the size of pathological changes and their link to the surrounding anatomical structures, pathological changes in maxillary sinuses and temporomandibular joints are just some of the possibilities of 3D/CBCT scanning. Here, at OrtoDent Digital we work with state-of-the-art devices which have four field sizes – FOV (Field of View) 5x5 cm, 8.5x5 cm, 8.5x8.5 cm, 12x9 cm. 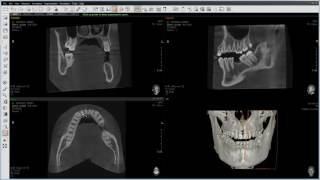 This allows us to meet all the needs of dental radiology, while exposing the patient to minimal radiation. is the most advanced program in the world for working on 3D/CBCT projects. The training for using this program does not last more than 5 minutes.